MSAE 2014 year-in-review, plus what’s ahead in 2015. Eric Leonardson led a soundwalk and Chicago Phonography performance at Brushwood Center in Ryerson Woods on January 25, 2015. Performers included Todd Carter, Chad Clark, Ed Herrmann, Monica Ryan, and Chicago Wildsounds members Roni Jachowski, Matt Connor, and Lisa Kenny. 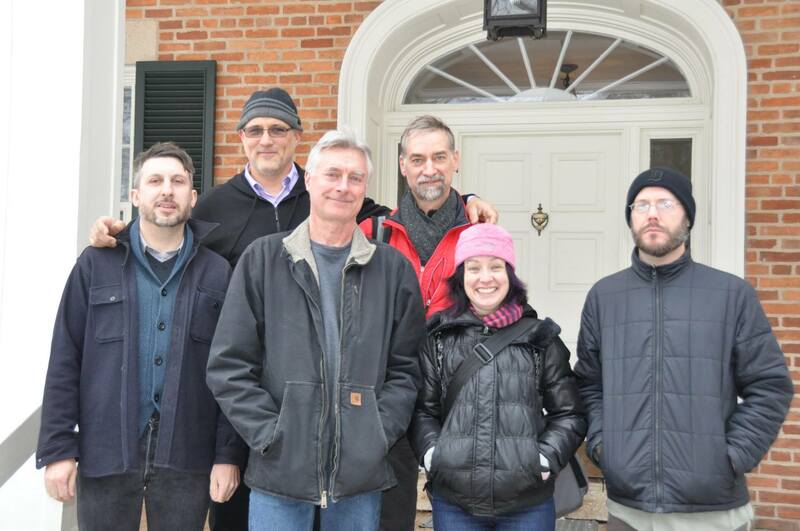 Nearly 60 people participated in the soundwalk including many Ragdale artists-in-residence. Chicago Tribune columnist Barbara Brotman published an interview with Eric Leonardson about the event on Monday, January 19. Nearly 60 people participated in the event. Chicago Wildsounds is a new and exciting acoustic ecology student group at DePaul University. We look forward to their upcoming public event "Rooted in Sound: A Night of Soundscapes," at 5:30pm on Thursday, March 5, 2015 at the DePaul Art Museum. Please visit our website for details. The American Society for Acoustic Ecology (ASAE) will lead a pre-conference Acoustic Ecology Recording Workshop for Balance-Unbalance 2015: Water, Climate and Place, Reimagining Environments. In the conference, Eric Leonardson and Andrea Polli will lead a panel entitled Eco-sensing in Higher Education Curriculum. Panel Participants are Linda Keane (The School of the Art Institute of Chicago), Leah Barclay (UNESCO Biosphere Soundscapes project), Christopher Preissing (Independent Artist), Lindsay French (The School of the Art Institute of Chicago), Meredith Hoy (Arizona State University), Leonardson and Polli. 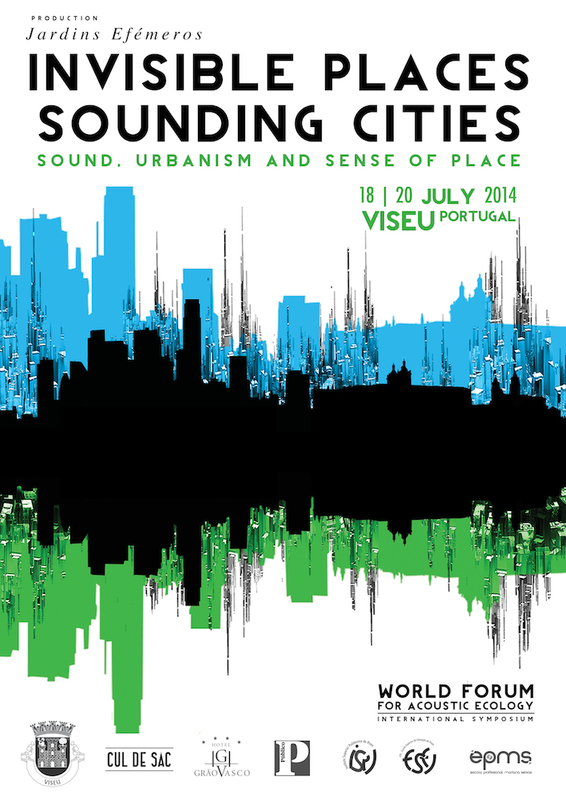 Leonardson will also present his paper, Our Sonic Playground: A Model for Active Engagement in Urban Soundscapes. Later in 2015, Eric Leonardson will publish three articles. "Our Sonic Playground: A Model For Active Engagement in Urban Soundscape" will appear in a special themed issue of the Journal of Urban Cultural Studies, on the Urban Soundscapes & Critical Citizenship conference, at the University of Limerick. Leonardson's presentation for the Sound in the Land Festival and Conference, "Acoustic Ecology and Ethical Listening," will be published in The Conrad Grebel Review, and "Sound and Listening: Beyond the Wall of Broadcast Sound" will be published in the Journal of Radio and Audio Media. 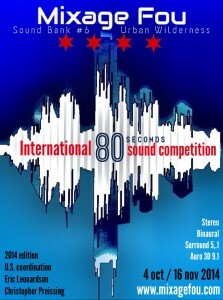 Christopher Preissing and Eric Leonardson coordinated the Chicago Sound Bank and selected awards for the 2014 Mixage Fou 80-Second Sound International Competition. The awards ceremony, on January 24, 2015 was part of festival REC in association with Phonurgia Nova, France Culture, and La Semaine du Son at La Gaîté Lyrique in Paris. There were 109 entries from seven countries including artists from ages 18 to 68. The competition winner was Bilel Aroua, a 30-year-old sound designer from Hammamet, Tunisia. Norman W. Long is a current BOLT Artist-in-Residence at the Chicago Artists Coalition (CAC). His solo exhibition entitled ‘scapes ran from Friday, January 6 to Thursday, January 29 at the CAC Gallery, 217 N. Carpenter St., in Chicago. Long also had performances on Saturday January 17 and 24 at CAC. Earlier in 2014, Long's "Electro-Acoustic Dubcology III" played in the Florasonic environmental sound series retrospective at Lincoln Park Conservatory. He led the "Washington Park Sun Ra Sound Walks," a multimedia project celebrating the soundscape of Chicago's Washington Park on the 100th anniversary of Sun Ra's birth. Its focus is on the park as a conduit for creative thought, cultural history, ecological preservation, and recreation. A live performance version was made at Experimental Sound Studio, in November. Long was also a 3Arts Residency Fellow at the Djerassi Resident Artists Program Learn more on his blog Into The Breaks. Craig Eley (Madison, WI) is currently an ACLS Public Fellow working with the weekly “To the Best of Our Knowledge” program at Wisconsin Public Radio. Following last spring’s discussion on the acoustic ecology listserv, Eley helped start the World Forum for Acoustic Ecology (WFAE) Metadata Committee to propose working guidelines on recording archives and databases for the rest of our community. In October, 2014 Professor Jacob Smith co-organized the Sonic Boom: Sustaining Sound Studies conference at Northwestern University, Evanston, IL. His forthcoming book, Eco-Sonic Media will be out this spring from University of California Press. On October 16, 2014 Professor Sabine Breitsameter gave the keynote address at The Listenn Symposium: Acoustic Ecologies of the American Southwest Deserts at the School of Arts Media + Engineering, Arizona State University. ASAE members Andrea Polli and Eric Leonardson, and Australian Forum for Acoustic Ecology (AFAE) member Leah Barclay, also presented in the 2-day symposium organized by Garth Paine, Sabine Feisst, and Daniel Gilfillan. Listenn is an interdisciplinary collaborative project that explores remote embodied landscapes of UNESCO Biosphere Reserves through sound. Jay Needham (Carbondale, IL) chaired Global Media Research conference in Austin, TX. Needham was past President of the American Society for Acoustic Ecology (ASAE) and was recently appointed to replace Eric Leonardson as ASAE Representative in the WFAE. Needham was also in Asheville, North Carolina for Ecomusics & Ecomusicologies 2014: Dialogues, serving on the panel presentation, "Listening Place: Using Sound as a Medium for Connecting People with Place." Eric Leonardson served as Artistic Director in the B3 Autumn School from September 29–October 4, 2014. He led a one-day Children's Hörspiel Workshop and a four-day Spatial SoundWave Workshop for students and professionals on the new Wave Field Synthesis system provided by the Fraunhofer Institute for Digital Media Technology. Technical assistance was provided by Felix Deufel and project management by Professor Sabine Breitsameter, from Hochschule Darmstadt. The workshop concluded with a public presentation on Saturday, October 4 at Städelschule, in Frankfurt am Main, Germany. On September 7, 2014 Eric Leonardson was the "Acoustic Ecology MC" for Water Music on the Beach, with Articular Facet and 6018North. Midwest Society for Acoustic Ecology (MSAE) member Norman W. Long joined up with Canadian Association for Sound Ecology (CASE) member Matthew Griffin to lead a soundwalk on World Listening Day in Millennium Park on Friday, July 18. On Saturday, September 20 Long led family sound ecology activities for "Go Outside, Evanston!" a partnered event with the Great Lakes Alliance, Evanston Ecology Center, and other groups. Monica Ryan led a World Listening Day soundwalk in Miller Woods, in the Indiana Dunes National Lakeshore on Saturday, July 19, 2014. On World Listening Day, July 18, Midwest Society for Acoustic Ecology (MSAE) co-chair Eric Leonardson greeted participants to the WFAE endorsed the Invisible Places | Sounding Cities conference on sound, urbanism and sense of place at the Escola Superior de Educação de Viseu, Portugal. On July 20 Leonardson gave a public performance on his self-built instrument at Misericórdia Church. Following their success with Sounding Out! Podcast Episode #7: Celebrate World Listening Day, MSAE members Tom Haigh, Monica Ryan and Eric Leonardson produced a second podcast. Sounding Out! Podcast #32: The World Listening Update – 2014 Edition features interviews with Barry Truax and Sabine Breitsameter. This podcast reflects on the 20th anniversary of the WFAE and R. Murray Schafer's 80th birthday in 2013. Phylis Johnson (Carbondale, IL), as Editor-in-Chief of Soundscape: The Journal of Acoustic Ecology, published the 2013 volume with guest editors, Makis Solomos and Kostas Paparrigopoulo. In late 2015 or early 2016, Dr. Johnson will publish a new book, Moving Sound: The Cultural History of Car Radio (Peter Lang Publishers). Christopher Preissing and Greg O'Drobinak incorporated field recordings into sound scores created for NON:op's opera project f(H2T) from Here to There, an immersive, self-guided, site-specific opera presented on April 24-26 at Chicago’s Bridgeport Art Center. Source materials for Preissing and O’Drobinak’s work came from urban and natural soundscapes collected on the streets of Chicago’s loop area and the Midewin Tallgrass Prairie, among other places. For the production both O'Drobinak and Preissing constructed platforms fitted with low frequency transducers that allowed the spectator to feel the sonic vibrations. In June, The Nature Conservancy Canada published "Acoustic Ecology and Ethical Listening" by Eric Leonardson on its blog. This article is an abridged version of an earlier piece written and published in the City Creatures. On June 5, 2014 Eric Leonardson addressed attendees as President of the WFAE for the opening welcome ceremony of Sound in the Land 2014, an international festival/conference of Mennonites and music endorsed by the World Forum for Acoustic Ecology (WFAE), held June 5–8, at Conrad Grebel University College, University of Waterloo, Canada. Leonardson also presented "Acoustic Ecology and Ethical Listening," a paper to be published this year in the Conrad Grebel Review. His soundscape composition entitled "Awash, Interior/Exterior Survey" was played in the "Soundscape Concert" program. On May 29, 2014 Ravenswood Elementary School and the MSAE hosted a presentation by Lauren M. Ronsse, PhD entitled "Effects of Classroom Acoustical Environments on Student Achievement." Dr. Ronsse is an Assistant Professor of Acoustics in the Audio Arts & Acoustics Department at Columbia College Chicago. 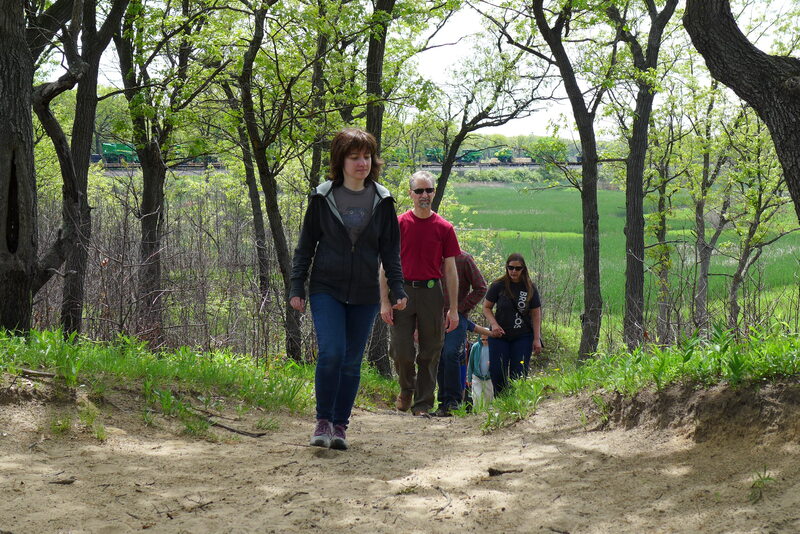 On Saturday, May 24, 2014 MSAE member Monica Ryan led a public soundwalk for the MSAE in Miller Woods, in the Indiana Dunes National Lakeshore. Attendance was great with participants from Chicago and Gary, Indiana. National Park Service Ranger Julie Larsen was finally able to participate, and was so moved by the experience that she is now incorporating sound and listening into her future nature walks. Monica Ryan teaches at Columbia College Chicago and The School of the Art Institute of Chicago. On May 12, The Omnimuseum Project published "On Sound, Listening and Public Engagement," an online feature article by Eric Leonardson. The Omnimuseum Project is a non-profit, collaborative effort devoted to embracing the world as a site for informal learning, founded by M. W. Burns. On May 1 and 2, 2014 in preparation for the Forum on Ethics and Nature: A Cascade of Loss and Recovery, Eric Leonardson led a soundwalk for staff and presenters in a pre-conference workshop at Windblown Hill, childhood home of Strachan Donnelley, founder of the Center for Humans and Nature. On the following day, Leonardson led two soundwalks focusing on bird sounds for attendees of the Forum on Ethics and Nature. This symposium was co-hosted by the Center for Humans and Nature and the Chicago Botanic Garden to address the ethical dilemmas faced in responding to loss due to massive species extinctions—including humans. This aim includes recovery of both cultural and biological diversity. On April 28, 2014, "Acoustic Ecology and Ethical Listening" by Eric Leonardson was published in City Creatures, the blog of the Center for Humans and Nature. This coincided with the center's Forum on Ethics and Nature: A Cascade of Loss and Recovery. Leonardson's piece serves as an introduction to explore his personal interests in human-animal connections in sound and acoustic ecology, and to playfully suggest what a "listening ethic" might be. The WFAE Quarterly News has re-published this piece in this July-August newsletter. On March 27, 2014, Eric Leonardson presented "Our Sonic Playground: A Model For Active Engagement in Urban Soundscape" in Urban Soundscapes & Critical Citizenship, a symposium at the University of Limerick, Ireland. The MSAE thanks Jen Mosier for designing our new logo!